From the outset, Katrina Naomi’s strikingly titled and entirely adept first collection plunges us into a world of polarities. Each of the book’s three sections announces a gulf: between ‘The Natural’ and ‘The City’, ‘The Sea’ and ‘Margate’, and ‘Darker’ and ‘Lighter’. In the opening poem we’re immediately reversing along the course of the Thames, from the sea, through the capital and then back up country to the source. ‘The Thames Never Breathes’, in fact, hinges on a rhyme between ‘nothing’ and ‘spring’, the inevitable opposition between the human and natural joined via a route that’s not that dissimilar to King Lear’s: the renewal of a ‘tiny spring’ only accessible if you’ve been through ‘nothing’ first. The final poem, ‘Kennington, Southbound, 11.10pm’, meanwhile, occupies a murkier psychological gap, dramatising a late-night encounter on a tube station platform in a discomfiting pair of monologues by the would-be murderer and would-be victim, both of them inadvertently finding common ground in the observation that the shoulder blades are ‘just the place to push’. This time there is only ‘nothing’ - no mention of ‘spring’. Between these two poems, of course, there are plenty of others on many different themes – storytelling sailors, encounters in pubs, Cornish holidays, photographs, conkers, the scientific dissection of a street. Vivid descriptions of flowers form a micro-strand – fuschias like ladyboys, a Plath-like description of gladioli – while sudden, sharp, sensory perceptions of colour and noise recur. The Hughesian ‘Storm in Winkworth Churchyard’, for instance, echoes with the sounds of the ‘plastic noise as the air vent skips/clean through the window’, ‘a roaring of the yews’ and a door crack’s ‘shriek of lightning’. All told, in fact, my only qualm would be that, in clinching an ending, Naomi’s pay-offs sometimes contradict the raggedy experience described in the preceding poem. The occasion, as it were, for saying ‘How would it feel to step off the turret of Dover Castle’ or ‘no more blood, just a hole’ doesn’t quite fit with the tenor of the lines that come before and, consequently, the endings are left with too much work to do. This, though, is probably merely a reflection of a current obsession in English-language poetry: the urge to ‘deliver’ something, whether that’s a nugget of wisdom, a punchline, a shrug, a ‘wild’ metaphor to justify poetry’s existence as another way of looking at the world. 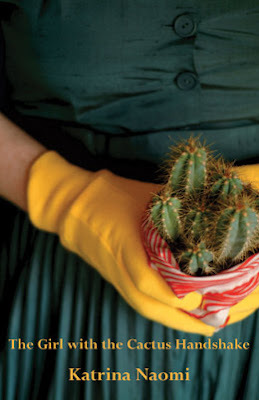 As it happens, the really engaging thing about The Girl with the Cactus Handshake are the poems which stick with the seemingly insignificant details and relish the language’s unexpected possibilities. Tom Phillips reviews regularly for Eyewear. Sounds interesting. I'll have to check her out.